Looks like the link they sent to me by e-mail can be used by anyone. Note you can get a card for 30 days for free - after which it's typically £30 (although you can get deals for £15-20/year). Now and again they bundle the card with other deals. Can't use at Pizza Express and Zizzi during December! 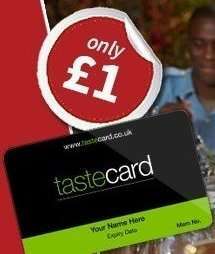 Your tastecard membership is an ongoing subscription service and will automatically renew 4 days prior to the end of your initial membership term. Your membership will continue to renew towards the end of each subsequent term until it is cancelled in accordance with our Terms and Conditions. You're gonna get charged after the £1 period is over. They used to do these for free for 3 months. Had loads of them. Can you not cancel as soon as the card has been delivered? If you have supplied an email address we will send you an electronic … If you have supplied an email address we will send you an electronic reminder approximately 3 weeks before your renewal is due to advise you of the details of the new subscription. If you do not want to renew your membership you should contact us by telephone on 0800 5677 241 or 01484 477 645 at any point within your membership period and no later than 5pm on the working day preceding your renewal date. This used to be worthwhile but so many restaurants have either dropped out or placed all kinds of restrictions on usage. Many won't take the card at all during December and many don't accept it Friday and Saturday. All you're really getting here is an extra free month (January) when people cut back on going out and all these restaurants are having their slowest period. HOT! Cheers, can't complain - 3 months membership for a £1....worth it even if used once in that 3 month period I guess! Thank you OP I've ordered mine.. like someone says above, use it just once from now until January and get a 241 meal for just a quid... Excellent deal! yeah guys, just don't forget to cancel or else you'll get charged £29.99! they only charge £1 so they can get your bank details!